The healthiest eaters among us incorporate vegetables or fruit in every meal. This can be tricky because vegetables take time to peel, dice, chop and wash.
How many hours have you logged chopping up your veggies? One nice short cut to replace your knife and chopping board is a grater. I own an amazing grater that my mother-in-law gave us (Thanks, Carol!) see below. It is RIDICULOUSLY fast in the kitchen for grating anything. It takes literally 10 seconds to grate an entire carrot and you don't need to peel the carrot. So, I made these carrot, cream cheese, and raisin bites to eat as a snack. Before I started writing this website, I would have just had the tortilla and the cream cheese (boring...). Adding the carrot not only makes it tastes better, it makes it more beautiful. This would be a great after school snack for kids or an after workout snack. Be aware that the entire tortilla cut up is going to set you back 200 calories so you might want to share this with a friend (or save half for later). These sound delicious!!! Will try this week! My daughter has made a decision for a vegetarian diet in the last few months, so I'm always looking for great ideas for snacks and meals for her, that are healthy and yummy. Love this idea, though she doesn't care for raisins (but does like carrots). I'll search around for a substitute, unless you have any suggestions...? Thanks for all your work on this blog! "This kinda looks like sushi made by an amateur drunk sushi chef." LOL! It totally looks yummy to me. You can even sustitue the raisins with yellow raisins, dates or dried figs. Thanks for the idea! I don't eat carrots or raisins because they are pretty sugary - but I think this looks like a great snack for kids (or the young at heart). I love your ideas! Thanks for a nice snack idea. All that is missing is a fun name so kids will love it even more...maybe Circus Pinwheels or Crafty Carrot Roll-ups? Using a Flatout Flatbread will be 90-100 calories instead of 200 depending on what type you use--and they have 9 grams of fiber each. Not a huge amount but every bit helps. 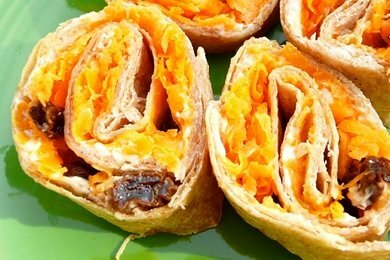 Love carrots and raisins together. Since I'm incorporating the Genotype Teacher recommendations into my meals, I think I'll make Yo-cheese and use that in place of the cream cheese. Later, substitute craisins for the raisins and make spelt tortillas. I've incorporated grated carrots into meat loaf, homemade tofu patties, homemade bean patties, meatballs, and muffins. As for the sugar, unless you're diabetic, carrots are actually very nutritious. The fiber helps slow down the rate the sugar gets into your bloodstream. I ve grown and eaten carrots my whole life and I've been diabetic almost as long! Anyway, I make what I think is a yummy carrot and lentil salad. Use a light vinaigrette, a few toasted pine nuts, and a handful of fresh cilantro. You can use this to fill a wrap or top an egg white omelet. @Gloria, I've seen carrot-raisin salad with pineapple added. Maybe you could try just putting pineapple and not raisins? That sounds great. I will have to try it. Love these. I'm going to try making it for the kids. They're not crazy about raisins so I'll try some slivers of apple, along with low carb tortillas. I've found that the low carb ones roll up more easily. Thanks for reminding me that I have a grater hidden somewhere in a drawer! Yummy, healthy snack and cost effective.. Gotta try this at home tonight.. I made this with children, easy fun and good to eat!